Women were allowed to act in the theatre until 1660 as it was judged to be unseemly for a woman to undertake such a profession. Young boys were therefore hired to act in the female roles. The costumes used for the female characters were extremely elaborate, reflecting the clothes worn during the Elizabethan era. The women's costumes worn by the boy actors were constructed with many layers of clothing. It would have therefore taken some considerable time, and the help of a dresser, to dress a boy actor in the costume of a female. Wigs, or periwigs as they were called, were readily available as they were in fashion at the time so this was not a costuming problem. However, the make up used by Elizabethan women, and therefore the boy actors, was! The white make-up was lead based and highly poisonous! The young boy actors were therefore very unhealthy, had unpleasant facial skin diseases and a high proportion actually died of lead poisoning. The boy actors who took the female roles were also paid the least of all actors. The Admiral’s Men paid boy players three shillings a week. The boys were apprenticed to adult actors and their wages were paid to their masters. In return the masters gave them board and lodging and a small allowance to spend on themselves. Nearly every color of clothing had its own meaning in relation to status and rank during the Elizabethan era. And these meanings were totally understood by the audience. The colors, materials and styles of the Globe Theatre Female Roles therefore conveyed an enormous amount of information as soon as the boy actors walked on stage. As soon as a character walked on the stage the fabric and color of his clothing would indicate the role of the character he was playing. The character and rank of an actor wearing a Globe Theatre costume made of velvets, furs, silks or lace would be instantly recognised as a member of the Upper Class. Cottons and taffeta would indicate a much lower status. A great deal of attention is paid the the fact that Lower Class Elizabethan women were not allowed to perform on the Elizabethan stage as it would have been considered to be lewd and highly immoral. This view was not taken regarding the appearance of Upper Class Elizabethan women who appeared in court masques! The mother of Queen Elizabeth certainly performed in masques! 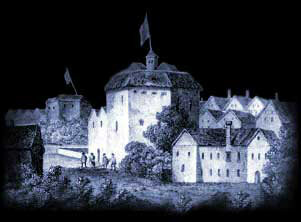 The first recorded appearance of Anne Boleyn at the Tudor Court was on March 1, 1522 was as a performer in a masque! Perhaps the element of disguise allowed for this as vizards, or masks, were always worn by the performers. But the more probable explanation was that these wealthy women of the court wanted to be included in performing in such an exciting diversion as a masque. Interesting Facts and information about the Globe Theatre Female Roles. Additional details, facts and information about the Globe Theatre can be accessed via the Globe Theatre Sitemap.